I have been spoiled, living near lots of green space with many foraging opportunities. Long sections of the River Wandle, Mitcham Common and Morden Hall Park have offered up such treasures as elderflowers and elderberries, wild plums, damsons, crab apples and blackberries. But there are some less wild areas that have proved treasure troves too. Sitting on the Croydon Tramlink on the way to Wimbledon all of last summer, I watched as a patch of waste ground next to one of the stops grew some of the biggest brambles I’ve ever picked. The kilos and kilos that I picked there were the base of the first wine I tried making. And a local park, basically a bit of grass behind some flats, is the home to a large apple tree. When we moved into our house nearly four years ago, the garden had been badly neglected. The people we bought it from had put all their energies into redecorating and rebuilding the house, but hadn’t been bothered about the gardening. This suited us, as we would both rather be outside digging than inside painting. It appeared as if there were the remains of a well-loved garden somewhere under all the weeds. There were trees that were probably planted as shrubs, and shrubs that used to be small plants. There was also the slightly crazy rockery, which appears to have been planted over the top of a WWII air-raid shelter, and which takes up a good quarter of the garden. For the first year or so, we hacked back badly overgrown shrubs, pulled up weeds and tried to fill in some of the holes with the plants we actually wanted to be there. My in-laws were generous with cuttings and seedlings from their garden, and we used some of the money we’d been given as wedding presents to buy more plants. We even received an apple tree as a wedding present. But there is still a lot to do, including replacing of the rotting, roofless shed, and building proper raised beds for the vegetable patch. But one of the pleasures has been discovering the plants we didn’t plant ourselves. I’m not sure if these are survivors from the old garden, or have seeded themselves from elsewhere. The euphorbia that suddenly appeared at the edge of the lawn, is now a features of one of the beds, the rambling rose that is growing up the fence and putting out small pink blossoms, and the wild poppies that sprang up all over the rockery might be considered weeds by many, but were welcome in the first summer when we had nothing else growing there. Among the welcome plants are patches of woodruff and lemonbalm. Finding these fragrant herbs unexpectedly felt a little like foraging in the back garden. 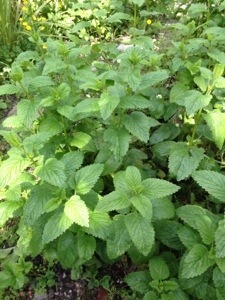 The lemonbalm is a relative of the mint family, and as such, can get quite invasive. As yet, it’s confined to a patch at the back of the rockery by vigorous weeding. Given half a chance, it would take over the garden. Again, I had no idea what it was, until, that is, I started to pull some up. The strong citrussy smell made it easy to identify. I also tried steeping it in alcohol, with some mixed results! 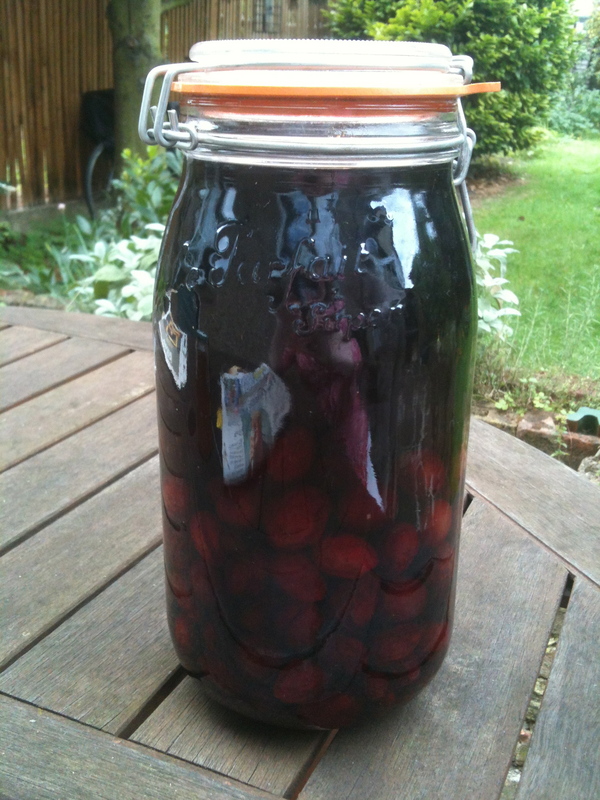 I was used to making sloe and damson gins, where the longer you leave the fruit soaking (and we have some still maturing from a year back) the better the results. So I happily added the lemonbalm leaves and some sugar to a jar, covered in gin and left it at the back of a cupboard for a few months. The final product is….interesting! It has a distinctly medicinal flavour, and we have been known to indulge in a small glass when we have colds. Trying to learn from this, we also tried soaking the leaves for just a couple of weeks in gin. Again, the flavour is quite strong and herbal. My husband has taken to using it like he would bitters – just a few drops added to a gin and tonic. More successful was combining the leaves with lemon to make a cordial. In this recipe, the leaves are soaked in the sugar syrup for just a few hours and then discarded. Lovely diluted with some sparkling water. I adapted this recipe for lemon and mint cordial, substituting lemonbalm for the mint. 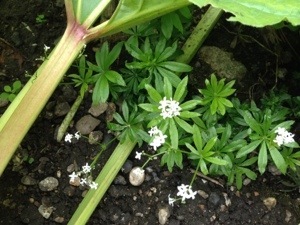 The woodruff has umbrellas of leaves and delicate white flowers. I had no idea what it was, but it wasn’t invasive and I thought it was pretty, so I didn’t dig it out. Then one night, I happened to spot a picture of it during a BBC4 programme on medieval herbalism. A quick search online and I read about its aromatic properties. While it’s still growing, or even when freshly picked, there is no strong smell. But after only 30 minutes or so, as it starts to dry, the magic happens. Even a small bowl of the drying leaves release a wonderful scent, somewhere between vanilla and fresh hay. No wonder people used to add it to their straw mattresses. I wondered if there were any culinary uses for it, and as often happens, my mind turned to booze. I left it in a jar, covered with a bottle of fairly cheap vodka. 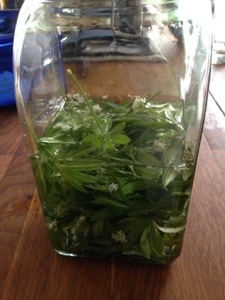 With the leaves and flowers strained out, it has a delicate green tinge to it, and tastes great with tonic. I think that it should also work in longer cocktails where you want a sweet, vanilla-ish taste. Loving your blog. I am nowhere near you in expertise but during my maternity leave 8 years ago I developed a love of discovering new plants when out for long walks trying to get the bairn to sleep. Still have that love and many an app on my phone which I use out and about to identify things. Looking forward to your next instalment.